It's a question every brand manager must ask. In our sluggish economy, businesses want to wring every dollar possible from their assets. One way to do that is by extending brands into new product lines. For example, Starbucks extended their brand to liqueur and ice cream. The company makes money and consumers can enjoy products with authentic coffee taste. It is good. But stretch a brand too far and it loses meaning -- and money. you'll tick off your most loyal customers who feel betrayed, thus giving competitors an opportunity to steal market share. Coke pursued Pepsi youth with New Coke. We all know how well that went. And Virgin can mean a lot of things -- travel, music, telephony -- but apparently not cola. Bic tried pantyhose on for size. Didn't fit. 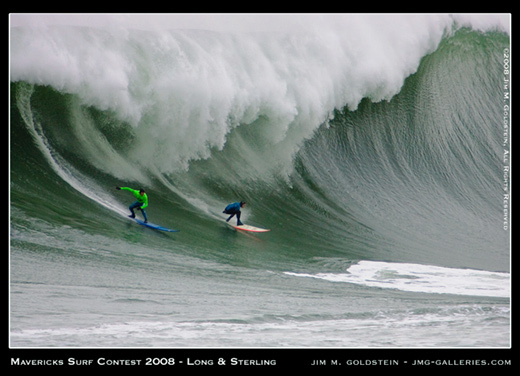 I live in San Francisco, 25 minutes north of a notorious surfing spot called Mavericks. Once every year or two, when the winter conditions are just right, the world's best big-wave riders are invited -- with only 24 hours notice -- to surf Mavericks' grotesquely giant waves. The bigger they are, the harder they fall. A 50 foot wave falls hard. It's a deadly contest. Literally. Today, Mavericks has a small, dedicated following of surfers and others who are drawn to its danger and unpredictability. For them, Mavericks represents the ultimate confrontation of Man vs. Nature. Those who survive the mountainous waves have cheated death. And until proven otherwise, these gods-among-men are immortal. At its core, the Mavericks brand means more than just a surf contest. That's why it has "permission" to extend to other categories -- up to a point. Mavericks Surf Ventures recognizes the potential of their brand. To build visibility, Mavericks will sponsor a live reggae music tour. The intent is to build broader awareness before applying the brand to clothing and other sensible -- and lucrative -- product categories. “There’s a good long-term position (company executives) are tapping into for the recognition and awareness of Mavericks. ... They need to make sure the spirit of the Mavericks brand is reflected and held true within the context of that sponsorship,” Shore said. So, yes, I do think it's a good idea to extend Mavericks into live music as long as the brand managers don't betray what the brand really means. A reggae tour is a natural fit. A Celine Dion tour is not. Beyond music, Mavericks could move smoothly into clothing or sporting equipment. But some product categories, say...nursing homes or flatware, would make no sense. Someday, Mavericks-branded products could compete directly against a surf brand like O'Neill, an adventure brand like North Face, and a human potential brand like the Olympics. As long as the Mavericks brand managers don't get too maverick, they can look forward to a brand that will keep on giving.